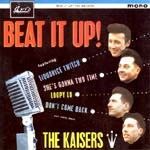 The Kaisers - Beat It Up! The Kaisers (Edinburgh, Scotland) have developed a good mimic of the early sixties British beat sound. While pretty garagie, this CD includes two instros, one just so-so, and one solid. Driven riff rock, just slightly up from a back track to a Liverpool '63 beat band backtrack. It has that fire and edge, but isn't quite melodic enough to hold up. Cool surf and spy filmage stuff, vibratoed, double picked in spots, and charming. The sax accents against the guitar are well placed and effective. This is a fine groover.